At Goteo Foundation, we’ve been working for the last five years with public institutions with a view to opening and improving their processes for funding projects and assigning resources. We’ve been talking about irrigation capital or crowdfunding 2x1 and we’ve used a thousand metaphors to communicate and explain this ethical practice, which is key for the development of our mission. Now, we want to make the most out of the launch of our new design for matchfunding calls, which is easier to understand and to use, to simplify the message and highlight the most important thing: what moves us to do this, namely the principle of co-responsibility. Matchfunding is the practice that allows us to take co-responsibility - which is part of Goteo’s DNA and of the Foundation’s mission - to its maximum expression. 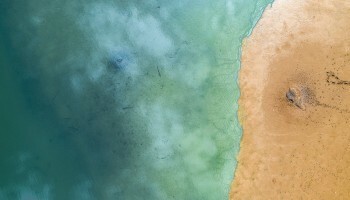 This principle expresses the shared commitment found in each of the practices we promote, from collective financing (in traditional crowdfunding and in matchfunding with institutions) to our training and co-creation methodologies, which are always motivated by the goal of achieving a better society. With this aim in mind, during the first half of 2016 we’ve worked to improve the design, aesthetics and structure of information of our matchfunding calls, so they can speak for themselves about their progress, scope and results and people can come to their own conclusion. But how does matchfunding work? This process starts when an institution, private or public, has a budget to develop or support a specific sector (health, culture, education, the arts, etc.). 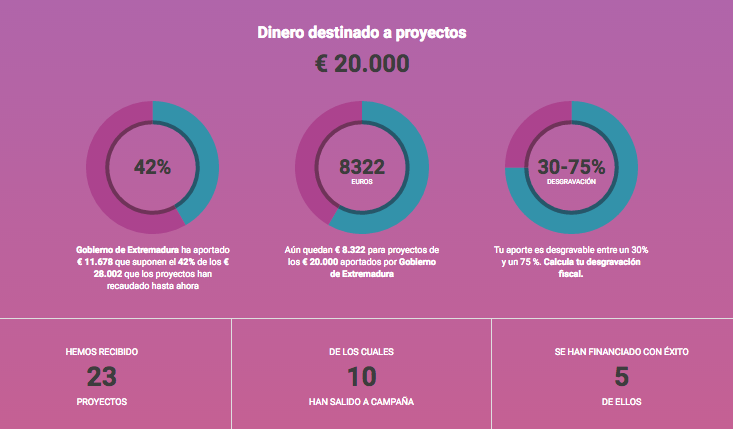 The institution, through Goteo, invites the members of the community in the relevant sector to submit for crowdfunding projects which need financing. Anyone will be able to contribute through our platform and, partly thanks to their connection to the institution, strengthen the potential impact of these projects. During the second phase, a period for preparing and submitting projects, training sessions are held so promoter teams and individuals can receive expert advice and feedback and suggestions from their peers. They will also be able to work on formulating and optimising their campaign together with technicians and members of the institutions which may later finance their projects. This is quite unusual in the process of grant giving and is certainly beneficial for projects. 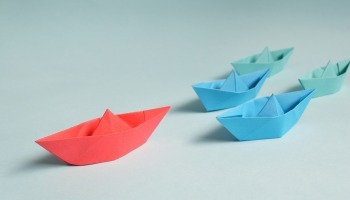 Later, when each project's crowdfunding campaign is started, the institutional money will progressively match the crowd’s contribution, euro by euro, as if they were communicating vessels, until the flow of institutional money ceases. Thus, both sources of financing (public and private, big and small) will be linked during the matchfunding campaign for each project, creating a multiplying effect. If one person donates 100 euros to a specific project, the institution will also contribute 100 euros, matching the donation. Institutions gain visibility and acknowledgement by being associated with projects for the common good, and with initiatives which have the support of society. 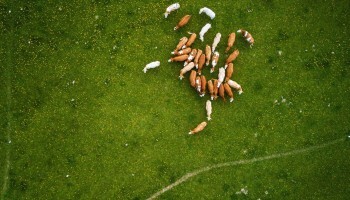 At the same time projects gain institutional support, financing, visibility and potential impact. Moreover, our data shows that matchfunding maximizes the “multiplying effect”: the amount of money contributed by the crowd significantly increases when there is institutional support, 180% on average. The more money contributed by the institution, the more likely the campaign is to succeed. In fact, success rate increases to around 90%, 20% higher than the success ratio for Goteo campaigns without matchfunding (70%). We’ve collected feedback from the user communities which have participated in our calls and have performed a comparative evaluation of several European matchfunding platforms, within the project Europeana DSI. We’ll continue to discuss the results in the Matchfunding Seminar organised by Goteo Foundation and Platoniq in Barcelona, on 1 and 2 December. Early findings revealed the need to develop additional improvements if we wanted to encourage co-responsible public and private contributions to projects that have the support of civil society. We saw, for example, that relations between individuals, communities and institutions could be redesigned by visualising crowdfunding projects’ needs (from projects carried out as part of matchfunding programmes). This can be done on the basis of data taken from their budget descriptions, their non-monetary needs and their aims within their respective areas of influence. This benchmarking study also identified which elements and changes had to be incorporated into the new design to enhance the user experience of citizens and institutions alike, and hence the action and interaction of users in each of their roles becomes more intuitive, visual and easier to understand. 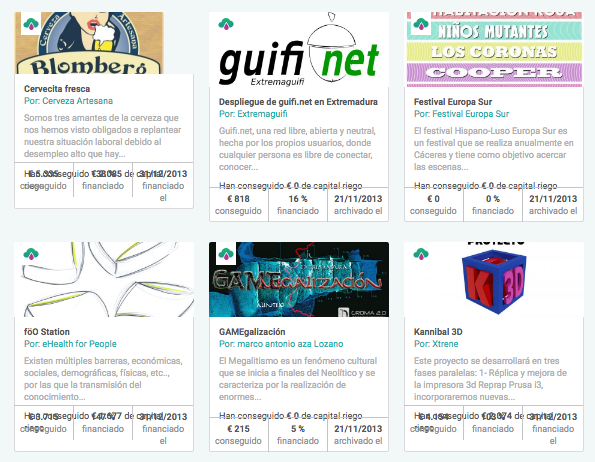 With all this in mind, we present a better-organised new site, packed with new visual elements including interactive maps, information, a timeline showing dates and significant milestones within the call, new icons related to different areas of social impact, structure by phases showing the state of the call, and many other implementations that have been documented in Goteo Foundation’s Github and the API entry-point for developers interested in matchfunding. In design, less is more. And in the redesign process that we’ve been carrying out for the last year, we are trying to apply this mantra to the fullest. 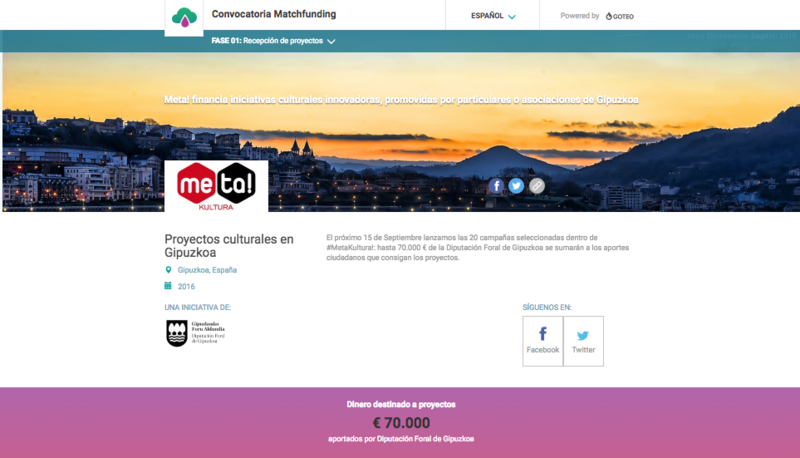 The first thing you want to see when you (probably) come from your social networks to the new matchfunding site is what is being financed, how much money is available, who drives the initiative, and where the projects come from. And this is the first thing you will see, thanks to the site’s navigation and visual design, which gives prominence to the institution that promotes the call, and other essential details. If what you've seen so far interests you, you can quickly scroll and find out the most important details at a glance (deadlines, training, campaign starting dates), you can contact us or access and download the complete rules of the call explaining in detail all the conditions..
You can navigate through the different phases of the call, discovering exactly what dates you shouldn't forget if you want to participate in the crowdfunding training programme and submit your proposal. 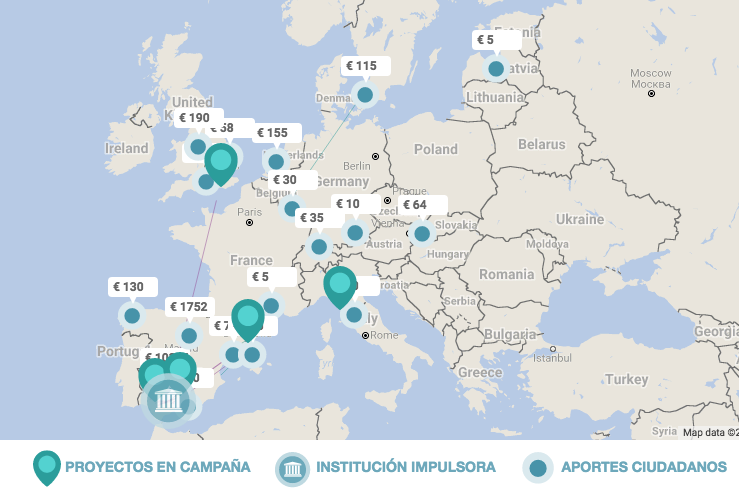 In addition, Goteo’s matchfunding site includes a map of influence of the call, showing the geographical location of the proposals received, the proportion of participation by gender, the expected scope of influence, and the location and method of enrollment for the training sessions. 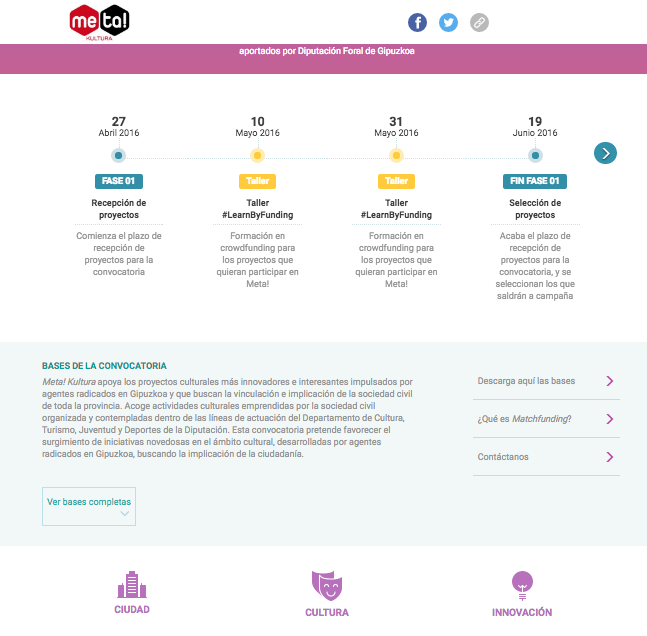 At all times you will see the PARTICIPATE button, through which you will be able to access the form for preparation and submission of proposals to the call. When campaigns are activated and begin to raise funds, the call enters Phase 2 and information on the progress of projects collecting funds takes centre stage. 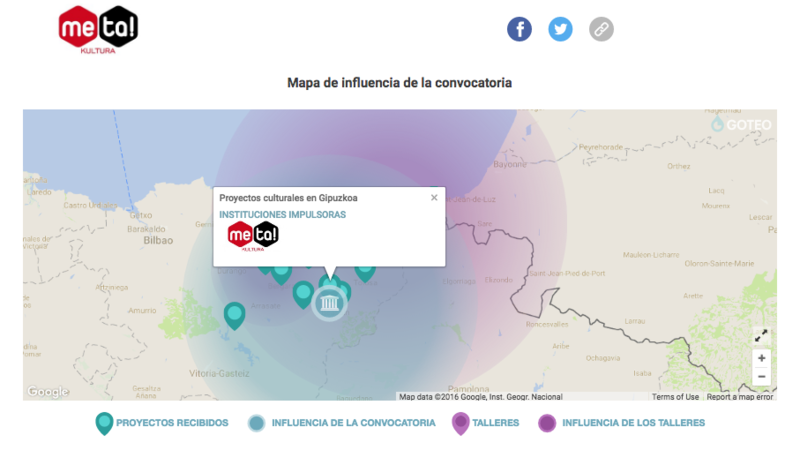 The map of influence becomes, at this stage, a map of contributions to the call, showing in real time and interactively, the flow of contributions and their origins (geographically and by type of user, citizen or institution). We’ve also incorporated a panel of real-time data related to the call, which includes several visualisations with dynamic information on the number of projects received, in campaign and funded, the amount and type of contributions (institutional or from citizens) received by projects, the amount of money committed by the institution that is still available to finance campaigns at the time of visualisation, and a table summarising citizen donations received by the projects as well as institutional contributions, which will be visible once both financing rounds are completed. 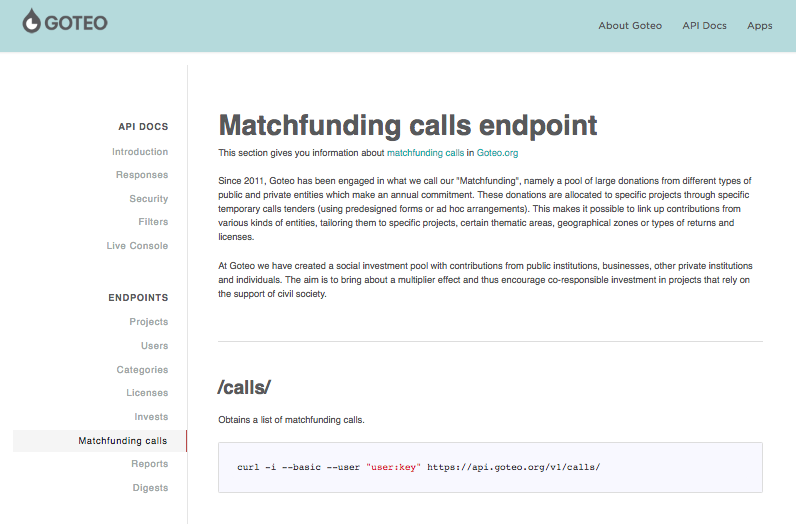 These are the most important changes we’ve incorporated in our redesign of Goteo’s matchfunding site. We trust it will make it easier to understand this hybrid funding model which brings about a shift in the way resources are allocated to projects supported by the most active and engaged communities. And we hope to inspire more institutions and entities to use this powerful tool as part of their social responsibility lines of action. If you liked reading about this new funding model you will find more information in our article published on Europeana’s blog: “Goteo and the case for match funding”.